You can take an icebreaker cruise on the Soviet icebreaker 50 Years of Victory. Adventure Life photos. For thousands of years the Arctic Ocean and its icebound islands have been a source of fascination to mariners, geographers and all who devote their lives to seeking out and exploring the unknown. The first known Arctic expedition was captained by Pytheas of Massilia in 330 BCE, a Greek mariner from what is now Marseille, who sailed to the mysterious land of "Thule." When he returned home to the sunny Mediterranean and described the wild streaks of color in the sky, the great white bears and the midnight sun, most people didn't believe him. Adventure Life of Missoula, Montana, organizes small ship cruises to remote regions of the globe, and their latest trip will take passengers to the North Pole on a Russian icebreaker called 50 Years of Victory, named for the victory over the Nazis in World War II and completed just last year after 20 years of construction. The Victory is the first Arktika-class icebreaker to have a spoon-shaped bow, with a steel ice belt hull 18 feet wide. The ship is powered by two nuclear reactors and equipped with an indoor swimming pool, a gym, two saunas, a library, a bar, a dance floor, a wood shop, an elevator, a helicopter, satellite communications and massage service. 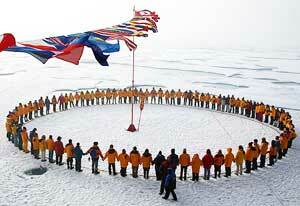 Members of an Adventure Life expedition form a circle at the North Pole. While traveling to the pole in comfort, passengers can learn from the on-board experts about the role the Arctic plays in the world's ecosystem and the abundant and diverse wildlife the region supports. An artist-in-residence leads interactive art workshops and passengers can attend the "90N Wildlife Film Festival" named for the latitude of the North Pole. The expedition's historian will also present a history of Arctic exploration and relate "tales of hubris and foolhardiness" about those who sought to claim the title "first to reach the North Pole." Since the time Pytheas, thousands of intrepid souls have ventured into the Arctic in the spirit of discovery, and many of them never returned. Many were backed by merchants who wanted to find a Northwest Passage, which would shorten their route to the silks and spices of the Orient. Many mariners died seeking a Northwest Passage, including Henry Hudson, who was set adrift by mutinous crew members in 1607 in the bay that bears his name and Sir John Franklin, who set out in 1845 with two ships, 128 men, one dog and one monkey, none of whom ever returned. The quest to reach the North Pole began, as far as we know, in 1827 when the Sir Edward Parry set out with 28 men and two boat/sledges. When they reached the polar ice pack, they lifted the boat/sledges out of the water and tried to drag them across the ice, but since the sledges weighed almost two tons each, they didn't have much luck. 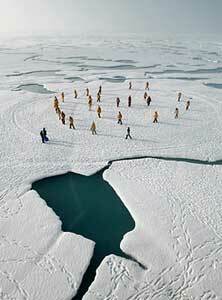 The ice was moving south faster than they could move north, so they wound up moving backward. In 1897 Salomon Andree set out for the North Pole in a hydrogen balloon, the Eagle, but it crashed 480 miles from the pole. Andree and his companions had plenty of provisions in their camp, but died from what was then a mysterious cause. Later scientific investigations determined they contracted trichinosis from eating undercooked polar bear meat. Open water at the North Pole is seen by some as a sign of global warming. Who was the first person to reach the North Pole? Well it depends on whom you want to believe. Two Americans, Frederick Cook and Robert Peary both claim the honor, but there are good reasons to disbelieve them both. In all likelihood it may never be known whether either of them ever reached the pole since it is, after all, a geographical abstraction -- a moving ice cap above a fixed point that can only be determined using navigational instruments. Likewise there is controversy about the claim of Commander Richard E. Byrd to have overflown the pole in a Fokker trimotor airplane in 1926. That same year the famous polar explorer Roald Amundsen (who is known to be the first to reach the South Pole, which is on land, as well as the first mariner to navigate the Northwest Passage) flew over the North Pole in a dirigible piloted by its designer, Umberto Nobile of Italy. They descended to within 300 feet of the ice pack and dropped Italian, Norwegian and American flags. But the first people known to have set foot on the North Pole, or, rather, on the constantly moving icepack directly above it, were Aleksandr Kuznetsov of the Soviet Union and his crew of 23 who landed a plane nearby and walked there in 1948. The USS Nautilus, a nuclear powered submarine passed under the ice in 1958. The Soviet icebreaker Arktika reached the pole in 1977, the first surface ship to do so. Since that time thousands of people have visited the North Pole using dogsleds, dirigibles, surface vessels, submarines, airplanes, skis and snowmobiles. In 1987 Shinji Kazama of Japan was the first to get there on a motorcycle. 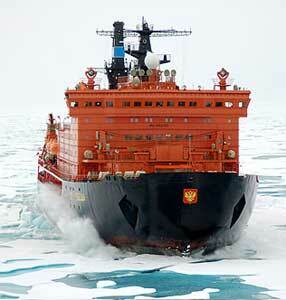 But the most practical and convenient way to reach the pole is aboard the Russian icebreaker 50 Years of Victory. The Adventure Life North Pole Expedition begins in Helsinki, Finland, just six degrees south of the Arctic Circle, where passengers can enjoy the scenic harbor, the green spaces and the spirited nightlife. From there they are flown to Murmansk, Russia, where they board the ship and get a send-up from a Russian military band. Traveling north across the Arctic Ocean, they can visit the ship's presentation room to learn about the history, ecology and wildlife of the region. The expedition leader may also deploy the on-board helicopter to give passengers an aerial view. Throughout the voyage, members of the expedition will be able to view the tremendous diversity of Arctic wildlife including birds, land mammals and marine mammals. 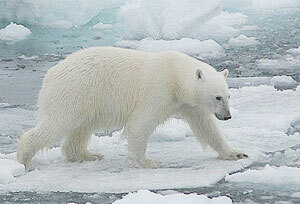 The polar bear, which weighs about half a ton, is the dominant predator of the Arctic. Millions of seabirds flock to the Arctic to breed, including the giant albatross, the tufted puffin, the Arctic tern and the ptarmigan. Narwhals, orcas, humpbacks, bowheads and beluga whales are found throughout the Arctic, as well as walruses, sea otters and six species of seals. Land mammals include reindeer, caribou, musk oxen, Arctic fox, moose, hares and wolves, but the dominating predator of the North is the polar bear, which weighs around half a ton. Upon reaching the North Pole, usually on the eighth day of the expedition, the ship turns south and travels to Franz Joseph Land, discovered by Austrian explorers and named for their emperor, which is actually part of Russia. Shore landings here allow expedition members to admire the Arctic geology and wildlife. After that the 50 Years of Victory crosses the Barents Sea and returns to Murmansk.